As I’ve mentioned before, I have quite long hair. This means that, despite the fact that my scalp can actually be a bit oily, the length of my hair must be treated considerably more gently. Think of long hair as being a bit like an antique tablecloth: it takes approximately two months to grow an inch, on average, so that by the time hair is a foot long, the ends are two years old. My hair is probably close to two feet long by now, and I have been growing it for the last four years. Now hair is something we take for granted. It grows, matures, and falls out. It’s like a disposable thing. But with long hair, we have this delicate thing that has been around for year. So treating it like an antique lace table cloth isn’t a bad way to think about it (Full disclosure: this was a sentiment I first learned on The Long Hair Community when I joined about eight years ago). And so, despite the fact that my hair is straight, normal, and relatively resilient under normal conditions, I rely on deep conditioners and hair masks as part of my regular hair routine, rather than using less potent formulations. As I’ve mentioned in the past, I’ve taken to washing my hair in one step to reduce hair fall in the shower, and the technique relies on finding quite thick formulations of both shampoo and conditioner. Because my favorite shampoo for this method is currently Deciem’s HiF Intensive Detox, which is a clarifying cleanser, I find that I need an extra-rich conditioner to protect my length from the cleansing power of the shampoo. 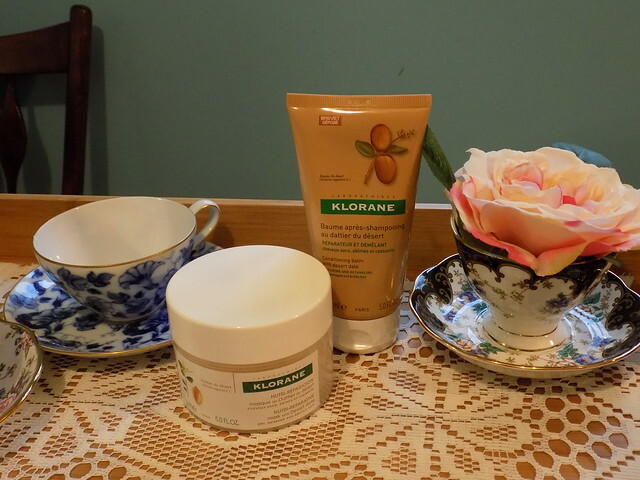 Enter Klorane’s hair masks. I’ve been intrigued by Klorane every since I stepped foot into a pharmacie in Bordeaux on holiday and saw the beautiful display. They just seemed so natural, elegant, and French, without being overly chic or expensive like Phyto. But I never managed to try them. Then, when I started frequenting Sephora’s online site, I started eyeing them again. Sadly, the shampoos all seem to have sulfate surfactants in them, which my hair seems to dislike. So I let it fall by the wayside again. Finally, I managed to get a jar of the Mask with Desert Date into my cart, thinking it would be fun to try out. I was in a “Let’s try to be French” phase of my beauty philosophy and it appealed to that. When I got the mask and opened it up, I was pleasantly surprised. Despite the fact that I generally dislike sweet scents for beauty products, this had a lightly confectionery scent that I still found pleasant. It helps that it’s fairly light and nondistinct (i.e., not explicitly vanilla or spice or anything recognizable, just lightly sweet and warm). It has a rich, thick, creamy consistency, almost like soft caramel frosting, and clings to my hair. I generally either wash my scalp or apply shampoo to the scalp as part of the one-step method, and then coat my length with conditioner and pin it up in a bun for a few minutes while I wash the rest of me. Then I rinse. It rinses cleanly, but leaves a nice slip, despite not having any silicones. I find that I can sometimes get away without using a leave-in creme or oil after washing, too. After the success of the mask, I wanted to try the Conditioning Balm with Desert Date because it has very similar ingredients but costs 1/3 less than the mask. Plus, it’s in a tube, which solves the one problem I have with the mask: the jar packaging is difficult to maneuver in the shower if one wants to avoid getting water in the jar. I ordered both to compare them and have found the Conditioning Balm a worthy replacement. It is just as thick, if not a bit thicker. Indeed, I sometimes find it difficult to squeeze out of the tube. But I manage and am rewarded with the same softness and manageability. One caveat: if you are used to using conditioners with silicones and the uncanny smoothness they impart, this conditioner may be a shock to your system. Because I wash my hair gently, I like to avoid silicones, as they can build up and make my hair oily or lank looking. So I’ve gotten used to the texture of my hair without them (although I will indulge occasionally when I’m going to wear my hair down). But at first, your hair may seem more tangled or rough because you are used to the texture when smoothed down. So if you require silicones to keep your hair manageable, this is probably not for you. And, of course, check the ingredients for your particular sensitivities. It does have a couple ingredients that I know might make my skin break out, so I make sure to wash my back after rinsing the conditioner to avoid spots on my back, but I haven’t seen a problem with hairline spots since I started using this. The bottom line is that this is my favorite conditioner right now. If I didn’t still have a few others to finish up, I would use it exclusively, price be damned. NB: I bought these products with my own money and have not been provided any incentive to review them. All opinions are my own. Need to do a hair mask tonight!! It really is a lovely way to treat yourself, isn’t it?